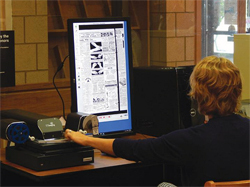 With the h elp of numerous donors, Bayliss Public Library was able to unveil their new digital microfilm reader during a ribbon cutting ceremony Thursday Evening at the library. The new digital microfilm reader will replace the older machine, and allow for easier access to emailing and copying the bygone film. The staff of the library held a brief presentation and get together prior the ribbon cutting ceremony inside the Community Room.